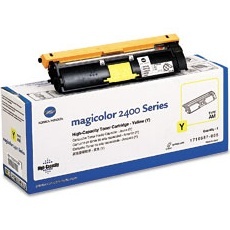 Genuine OEM Konica-Minolta Toner Cartridge, Yellow, High Capacity 4,500 page yield. Konica-Minolta part number: 1710587-005. Color Laser Toner Cartridge compatible with Konica-Minolta magicolor 2400, 2430DL, 2450, 2480MF, 2490MF, 2500W, 2530DL, 2550, 2590MF. This is straight from the manufacturer of the printer, so it worked as expected. No problems out of the box, clear prints, no operating issues. I'm tired of paying the sky-high prices though... will try the re-manufactured toners next time. Remanufactured Konica-Minolta Toner Cartridge, Yellow, 4,500 page yield. Replaces Konica-Minolta part number: 1710587-005. Color Laser Toner Cartridge compatible with Konica-Minolta magicolor 2400, 2430DL, 2450, 2480MF, 2490MF, 2500W, 2530DL, 2550, 2590MF. Remanufactured Konica-Minolta Toner Cartridge, Cyan, 4,500 page yield. Replaces Konica-Minolta part number: 1710587-007. Color Laser Toner Cartridge compatible with Konica-Minolta magicolor 2400, 2430DL, 2450, 2480MF, 2490MF, 2500W, 2530DL, 2550, 2590MF. Remanufactured Konica-Minolta Toner Cartridge, Magenta, 4,500 page yield. Replaces Konica-Minolta part number: 1710587-006. Color Laser Toner Cartridge compatible with Konica-Minolta magicolor 2400, 2430DL, 2450, 2480MF, 2490MF, 2500W, 2530DL, 2550, 2590MF. Remanufactured Konica-Minolta Toner Cartridge, Black, 4,500 page yield. Replaces Konica-Minolta part number: 1710587-004. Laser Toner Cartridge compatible with Konica-Minolta magicolor 2400, 2430DL, 2450, 2480MF, 2490MF, 2500W, 2530DL, 2550, 2590MF.